If the wall-to-wall media coverage of the birth of Prince George Alexander Louis of Cambridge proves anything, it is the American people’s unending fascination with royalty. On this side of the pond, no family has come closer to attaining regal status in the eyes of the public than the Kennedys. For those interested in an afternoon of immersion in the Kennedy mystique, Washington’s Newseum has put together an exhibit that captures the highs and lows of John F Kennedy’s public and private life, his presidency and his untimely death in Dallas. “JFK” is spread out over three of the Newseum's seven floors. The first part of the exhibit, titled “Capturing Camelot” is a well-presented look at the work of photographer Jacques Lowe, who documented the lives of John and Jackie Kennedy between 1958 and 1961. Lowe can justly be considered the first modern day presidential photographer, and his photographs played a major role in creating the Camelot mystique that surrounded the Kennedys. His work includes a number of images of Kennedy during his 1960 presidential run, the ups and downs of the campaign. There are also more intimate photos of John, Jackie and Caroline Kennedy during intimate family moments at their home in Georgetown and at the Kennedy compound in Hyannis Port. Largest and most striking are the stunning color portraits of Jackie, a number of which made it onto the cover of Paris Match magazine. The exhibit is all the more remarkable considering the fact that the negatives of all the 70 images on display were destroyed on 9/11; Lowe had stored 40,000 negatives of his Kennedy photos in a safe at the World Trade Center. The images were digitally restored from contact sheets Lowe had stored at a separate location. 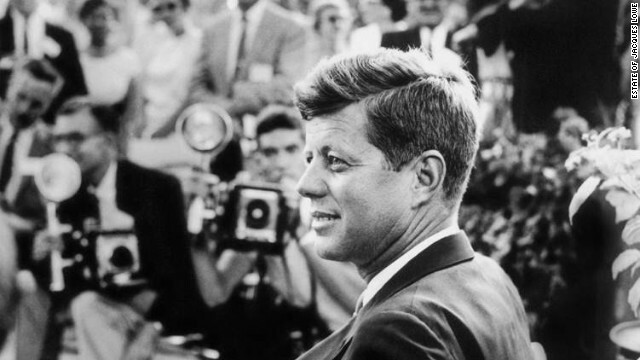 “JFK” has been timed to coincide with the fiftieth anniversary of President Kennedy’s assassination, an event highlighted in the second section, titled "Three Shots Were Fired.” A video compilation of breaking news clips featuring Walter Cronkite, Chet Huntley and others takes visitors through the events of the afternoon of November 22, 1963. The video powerfully conveys the magnitude of the event, as well as depicting the networks’ scramble to cover the first major breaking news event of the broadcast television era. A number of significant items are on display, most significant of which is the camera used by Abraham Zapruder to capture the famous film of the moment Kennedy was shot. Also on display are a variety of journalistic tools of the trade used to report the shooting: a CBS News mobile camera used in Dallas and the typewriter used by reporter Merriman Smith to file reports from Dallas. Kennedy’s assassination is an event seared in the nation’s collective memory. Everyone alive at the time remembers where they were the moment they heard the news. As visitors leave the exhibit, they pass a bulletin board where they can share their stories on note cards for others to read. The final piece of the exhibit is “A Thousand Days,” an original documentary screened on the Newseum’s 100-foot-wide video wall. The film looks back at the notable events of his presidency, including the Cuban Missile Crisis, the birth of the civil rights movement and Kennedy’s speech in front of the Berlin Wall. “JFK” is on display through January 5, 2014.